The Busta Unit from Baldwin Industrial Systems is specifically designed to deal with small volumes of difficult to treat waste water in a single application, while being compact, tough and simple to operate. The Busta Unit is ideal for commercial and small industrial users generating as little as 100 litres of contaminated waste water per day. The unit separates and removes emulsified oils, heavy metals, suspended solids, phosphates, fats, and greases. FILL - transfer the waste water into the treatment tank. MIX - add RM-10 chemical and turn the unit on (the auto/off timer allows the operator to return whenever they like). DRAIN - open the valve to drain the clean water, then drain the encapsulated sludge into the filter bag. EMPTY - dump the sludge into a waste bin. Once this process is complete simply refit the reusable filter bag and close the valves and the unit is now ready to treat another batch. 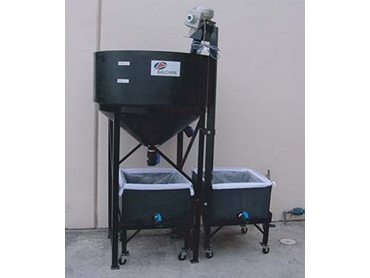 The Busta Unit from Baldwin Industrial Systems is versatile and flexible. Should the waste water being treated change, the Busta Unit will allow additional chemical dosage, longer mix times, or a different chemical formula. There are also minimal installation costs involved with the unit, the operator simply connects power to the mixer and clean water to the sewer. The ideal batch size for the unit is from 300 to 500 litres, meaning operators can carry out daily or weekly treatments to suit their volume of waste water. Two discharge valves allow clean water to be released first (for possible reuse) no matter what type of waste water is being treated. Rental terms are now available with a low deposit and plus easy monthly payments.